Mixed Age family classes include songs, rhythmic rhymes, movement, and instrument play. These activities are presented as informal, non-performance-oriented musical experiences--developmentally appropriate for children and easy for parents and caregivers--regardless of their own musical ability. Your child can sing, move, and play in a class from the time they are an infant all the the way until they are ready for school - enough time to enjoy 9 different song collections! 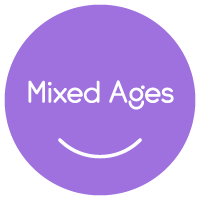 Mixed Age Classes are for children 5 years and younger and their parents/caregivers. Child development researchers discovered that grouping children of different ages in one class encourages natural, family-style learning. Such a discovery led to Ken Guilmartin and Dr. Lili Levinowitz, the co-founders of Music Together®, to bring such an early childhood family music class to communities across the country back in 1987, and the music hasn't stopped since! In this class, everyone participates at their own levels: babies vocalize, listen, and observe; toddlers play and experiment; and preschoolers build confidence as they emerge as classroom leaders. Grownups are happy because everyone can come to class together.